Our butcher is coming next week and he will do two beasts this time, so we are getting organised. I've written a lot about butchering over the years and this will be our eighth and ninth animals killed on our own property. On that last day, they will know no fear, maybe some curiosity (who is that strange man pointing that stick at me?) and it will be a quick end to a fairly peaceful and comfortable life. Its not such an easy day for us, it can be quite emotional seeing the death of an animal that you've raised from a young age, not to mention physically draining putting all the meat away, but its all worth it to get the best quality meat possible. We are gradually getting more adventurous with our own recipes. Even though the butcher offers marinade for the BBQ steak, stuffing for the rolled roast, flavoured brine for the corned meat, and pre-made sausage mix, we usually refuse the marinade and brine, and provide our own stuffing and sausage mix (and lately sausage skins as well). The last few years I have bought an organic sausage mix. The main reason was to avoid MSG in the standard mixes. If you look at the ingredients in the standard butcher sausage mixes, they are generally pretty cheap and nasty. The organic one was nice, but I couldn't get hold of the company to order it again this year, so we decided to try making our own. Several years ago we bought an awesome little book called "The Bush Butcher's Guide to Home Cured Meats and Sausage Making" by Michael Gale. This book contains 64 sausage recipes, as well as instructions for smoking meat and making bacon. 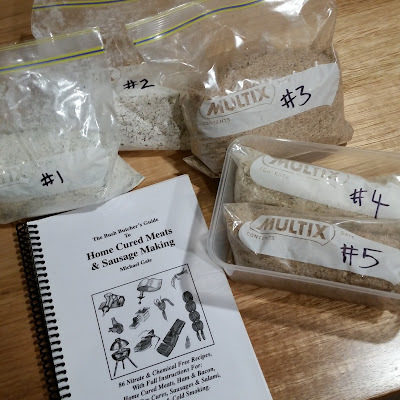 We did try a couple of the recipes and made our own sausages using the sausage attachment for our auger juicer/mincer, but they were a bit of a disaster due entirely to our own fault - over stuffing the sausages, although they tasted great. We never came back to it because we always had so many sausages from the butcher! I never wanted to bother the butcher with weird sausage requests, but then I realised that we can make up premixes ourselves, so it won't be any different to the bought ones. But I didn't want to make up a huge amount of sausages and find that we didn't like them (that happened a few times already and we had to feed them to the dogs/give them away/throw them out, which was a massive waste and disappointment). So I bought some mince (gasp!) 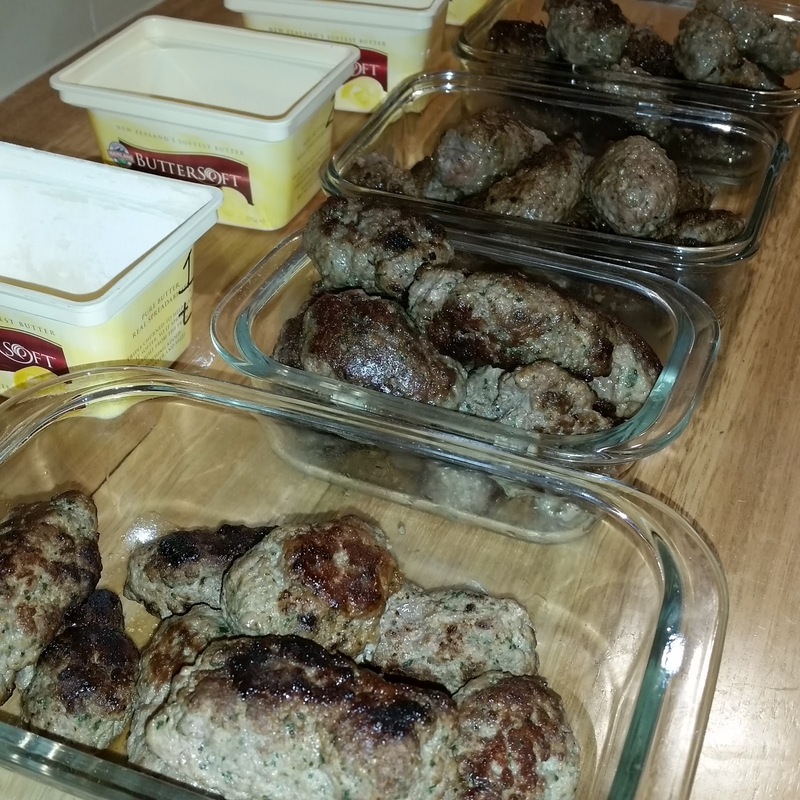 and made up mini batch of "sausages" without skins so that we could test each recipe. Then when we knew which ones that we liked, I bought bulk herbs from the supermarket and made up premixes for 10kg of sausages each. It was a lot of fun to try different herbs that I don't usually buy and make some very tasty sausage rissoles - things like mace and caraway seeds and nutmeg! I contacted Michael Gale and you can still buy his book through Gumtree and he said I was welcome to share a recipe with you, so here is one of our favourites so far. You can use this for sausages or meatballs (I later make the chicken bratwurst as meatballs with chicken mince and they were yummy too - I put in an egg instead of breadcrumbs). Have you made your own sausages? Any favourite recipes? Any tips for homekill butchering?